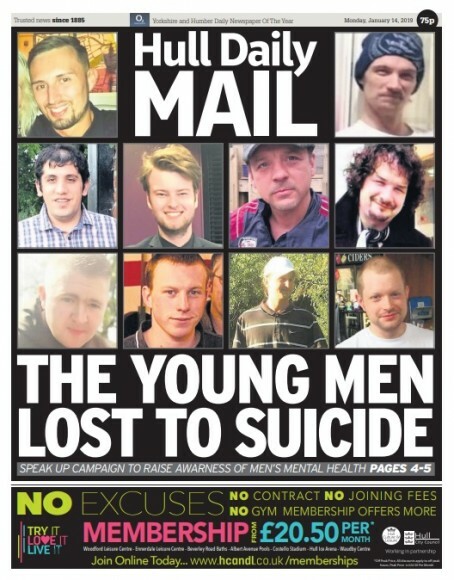 The families of male suicide victims have backed a regional daily’s campaign to raise awareness of men’s mental health. The Hull Daily Mail and its sister website Hull Live have this month launched their Speak Up drive. The campaign has been launched after two men, who did not know each other, jumped from the Humber Bridge minutes apart on the Saturday after Christmas. Ian Conlin, the father of 24-year-old Sam Conlin, who was one of the victims, has backed the Mail’s campaign along with the families of others who have taken their own lives. The campaign was launched last Monday on the front page of the Mail, pictured. Of the reaction received since its launch, Hull Live digital editor Jenna Thompson told HTFP: “The response from readers has been overwhelmingly supportive of the campaign. “Many have come forward to share their own mental health struggles and have spoken about the importance of talking about these issues openly and honestly. The Mail’s campaign follows similar calls for more to be done on mental health from various regional journalists in recent years. They include Glasgow Live’s Gary Armstrong, Manchester Evening News what’s on editor Simon Binns and Wales Online’s Bronte Howard.